We are a 'bottom-up' grassroots organization which believes that the wisdom in our profession resides in the hearts and minds of those who work each day: by the bedside in hospitals and hospices, in oncology and pediatric units, in clinics and home visits, within correctional centers, in homeless shelters, in veterans' centers, in coffeehouses, on campuses, in churches, synagogues, temples and a plurality of other settings. Our heart and soul rests in our 'Practitioner Communities'. These Practitioner Communities are composed of individuals who meet regularly and who are committed to the personal and professional formation of one another. Community life is rich and positive, structured yet flexible. 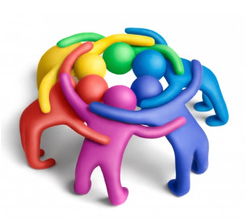 Practitioner Communities offer the opportunity for an individual to enjoy support, counsel and accountability from colleagues who know you, who are familiar with your strengths and weaknesses and understand your unique spiritual rootedness and professional situation. Each Practitioner Community has significant autonomy to operate and function as the community feels is necessary for the individuals in it. CSCPF encourages the Practitioner Community to decide on the frequency of meetings -- some gather monthly, others gather quarterly. In addition, often the length of the meeting is dependent on the number of active members. Some communities choose to meet and share a meal which creates time to bond more deeply while focusing on case conferences, consultations and didactics that are led by members of the group. The Practitioner Community will also engage in certification and recertification review process for its members on an as needed basis. These Certification Review Boards are conducted by the members within each community. Practitioner Communities, the life-blood of CSCPF, are required to adhere to the standards, policies and procedures of CSCPF.